You should absolutely not get crosstalk between channels. I would suggest disconnecting the xlr and switches. Try just connecting the rca. Make sure that the signal is getting applied to the central pin and that ground is going where it should. Did you bias it correctly? F4, Impasse, His masters noise, Troels Gravesen OBL15 and a stack load of analogue synths. - Do you measure continuity from input L hot-middle-pin to input R hot-middle-pin? - Do you measure continuity between the two used pins of the back switch in position A? - Do you measure continuity between the two used pins of the back switch in position B? - Do you measure continuity between the XLR pins that are connected? Don't just desolder things, do some troubleshooting first. It could save you a lot of time. Appears that the RCA jack outer conductor is against the case and not isolated. Follow this link - then look at your amp. Surely you must have some kind of a guess? An intuition of some kind? When you ask yourself "in what way(s) is the input different from the output?" do any of your answers suggest anything related? The thing (smartphone? CD player?) which drives the input of ACA, is not a big heavy device with large power supply and large output transistors bolted to heatsinks. It's small and modest, often battery powered. The thing which is driven by the output of ACA (loudspeaker) is a big heavy device with large diameter wires that operate at high current. How high? Greater than 1 ampere when playing loud. DC operating points get the circuit to work. Also, the DC bias of the output device has to be somewhere about halfway in-between ground and the rail... because the amplifier has to make the speaker cone vibrate; that is, the amplifier's output device has to push the cone out as well as pull the cone back in order to get the vibrations. Which means our signal, the music, is AC. Having DC on the output will actually make the speaker cone just push out in one way and kinda stay pushed out and make a new neutral point, and the signal will make it oscillate around that new neutral. That's not ideal at all mechanically, and unnecessary heats the voice coils. SO..... The amp has to operate with certain DC parameters for operation, but the signal (output) is only AC. Something has to keep the 150w 24v DC PSU from appearing on the speaker terminals. Exquisitely concise illustration! I’ve never seen it better said anywhere. Using my M2X amp I was NOT experiencing crosstalk, when using the ACA, I was. Therefore, logically the problem was somewhere within the ACA amp. This was not quite the case. Since built, the ACA has been working without flaw as my reference work-desk amp, which is a sub-satellite configuration. 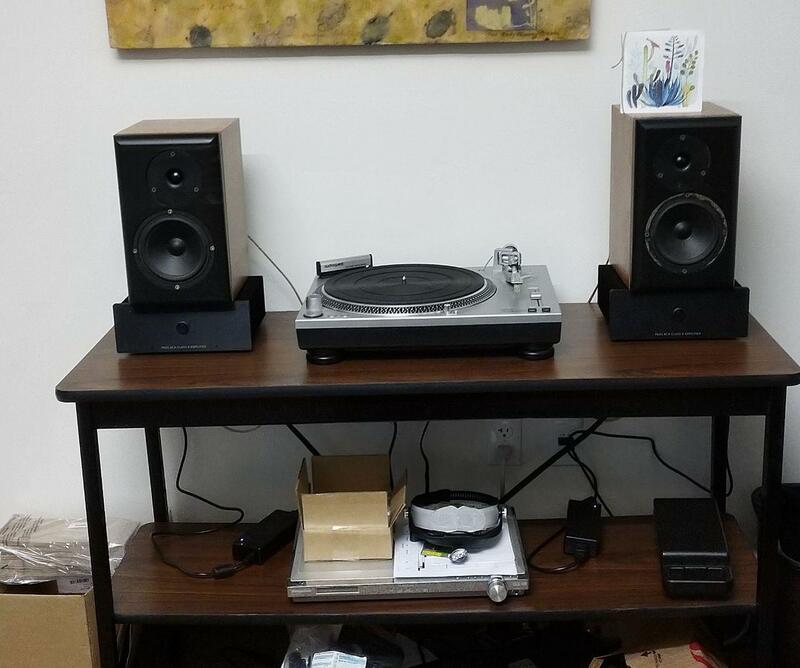 I purchased a second, very nice SVS sub to compliment another room's Snell KII speakers. Here is the problem: the SVS sub has no speaker inputs/outputs, only RCA, and on the recommendation of the SVS customer service manager purchased: Russound ADP-1.2 Speaker-level to Line-level Adapter at Crutchfield.com (See attached picture)! I removed the Russound and sub and everything on both amps works fine. Testing the Russound with a DMM to see if it was badly produced showed me the answer. When wiring the banana plugs to all speker wires, I followed my strict rule that red is right and always to positive, left is black and always to negative. This worked well for the M2X, but the ACA uses a reversed system. The reds are connected to each other in the ACA and the russound has the negatives connected as together. As long as I reverse the wire pairs to the Russound when using the ACA, all works well. Reversing the speaker cables on the russound fixes the problem for the ACA and then creates the same problem on the M2X. Finished my second ACA amp. It went much faster this time (5-6H vs 10+) but I made a few more mistakes along the way. Nothing major but let's say I had to re-solder a few things... also the LEDs are not fitting as well for some reason. Besides remounting them I might replace them with something more subtle? Not sure yet but I don't think I can take the bright blue staring at me but I also don't want them off completely. As to the sound. I have a pair of OkaraOW1 / Dennis Murphy ( MurphyBlaster Productions ) Hiquphon OW1 / Vifa P13. I tore out the passive crossover and redesigned it with a miniDSP DDRC-24 a year ago. Before the ACA I was using an old Panasonic class D 6 channel amp and I was pretty happy all told. However now with the ACA it is really very clear that my crossover design is pretty terrible! So by that measure, I'd say they are very good! The new combo is certainly sufficiently loud which was something I was wondering about. I am not sure if my line level is maxed out but with my source at an indicated 100% it is a bit louder than I like it and really it's sounding as good at 100% as it is 60%. Last edited by alextab; 15th April 2019 at 07:05 PM.